The pictures of the demolition of the line at Dawlish in the storms is quite a shock, even though we know how vulnerable that line is to the weather. It also shows graphically that with more unpredictable weather likely to become the norm in the years to come as our climate changes, the South West is increasingly likely to be at risk of severe dislocation. The GWR line is going to suffer more grief in the years to come and, let’s face it, constant repairs may make it economically unviable. 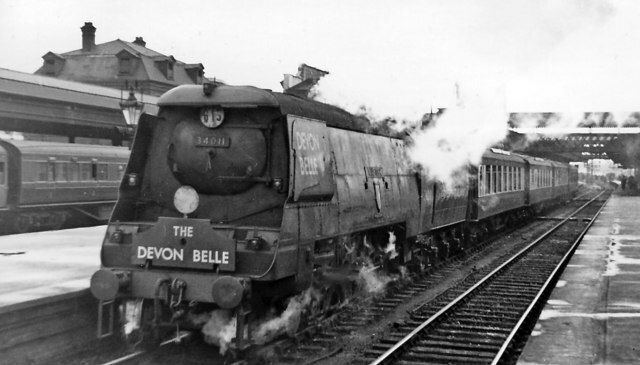 We have joked that the LSWR knew what they were doing when they went down to Plymouth via Okehampton, Dartmoor and Tavistock but surely the reinstatement of this route must now be considered as a necessary project for future investment to ensure that the SW can maintain its economic links with the rest of the country. My view is that this easily trumps any of the claims and counter claims about HS2. While the HS2 proposals are subject to intense debate about their value for money, the case for reinstating the Southern route to Plymouth seems more of a no-brainer. The decision of Network Rail to just happen to mention this to the BBC this morning: ‘Network Rail chooses Dawlish Alternative Route’ suggests that they have been wanting to do this for a while and are using the present moment of crisis to bring everyone’s attention to the fact that even if it would cost several hundred millions of pounds, the Southern line is a vital development that will become more important the more the sea washes the GWR away on the Dawlish seafront. There are alternatives, though. The Teign Valley route might be possible although I suspect it is also too low lying in places and there is also the Dawlish avoiding line that was mooted in the 1930s but never built. It is interesting though that NR have almost immediately explicitly rejected these alternatives and are only talking about the Dartmoor line. If this route is going to be built. and I think it will be, other opportunities present themselves that would be good for the Devon economy and public transport. The SR line round via Tavistock had several branches almost all of which closed in the 1960s but, with a renewed line linking north and south Devon, could this not be the time for the strategic authorities to take a much wider look at how their transport infrastructure might be renewed? Might this not be the time to make a claim for returning the railway to Bude or Padstow or indeed Ilfracombe? 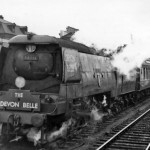 I may be GWR to the core but the return of at least a few of those lovely Bulleids to Tavistock and on to Plymouth is something to sweeten the pill as we worry about Dawlish and Teignmouth! A well written piece. Thank you. I am all for some sort of alternative provided it is exactly that-an alternative during bad weather, and not a replacement. We must never lose this vital piece of our heritage. If money can be found for a line few people want (HS2), perhaps that money should be diverted to a line many people need (SR Exeter-Plymouth)Foolishly much of the land was disposed of (in common with most other lines closed by Beeching)but reacquiring it is a better option than starting from scratch. Now is the time to make radical and vital decisions such as why not rebuild the Great Central (a continental loading guage route to the north) instead of upsetting everybody with HS2 – sorry present day Great Central! Well, I think it is testing the water but it’s only an opinion. Does anyone know any insiders who can comment?